Redeeming oneself in the eyes of South Carolina’s judicial system can be extremely difficult, especially if one strays off the straight and narrow. But for citizens who are trying to turn their lives around, dedicated professionals like 2L Chelsea Clark are working hard to help them deal with their legal issues. As a S.C. Bar Foundation Public Interest Fellow, she’s been working on a guide to criminal record expungement. 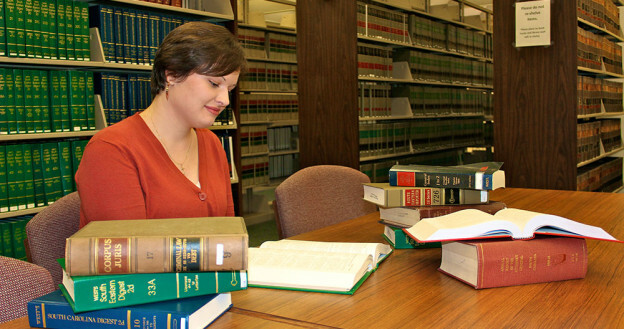 Clark began this past summer spending two weeks in the Judicial Observation and Experience Program, auditing family court and gaining perspective on the court’s responsibility for legal offenders. Following that experience, Pam Robinson, pro bono director at the law school, encouraged Clark to pursue a placement with the S.C. Center for Fathers and Families. The center has seen a need amongst participants in its various programs to better understand how criminal records work. For some with minor offenses, pursuing expungement or a pardon is an option that few knew how to navigate. Gale DuBose, Clark’s direct supervisor at the center, is thrilled with Clark’s work on the expungement guide and the overwhelmingly positive response it has received. “Chelsea did an amazing job, and we loved having her this summer. We expect great things from her in the future,” DuBose said. “There were so many people helping me figure out the best path and combining public service law and criminal law was such a natural choice. It was serendipitous,” Clark said. Serendipity might have played a role in Clark’s placement with Fathers and Families, but it’s her drive to succeed and her empathy for those who need a second chance that will take her far. “At the court house you hear the perspective of the judges, the deputies and prosecution teams, but there is also a flip side: the non-profits and people who are trying to change the system to better benefit the individual. I can now see both sides, and if you do not respect the system, you will have a hard time changing it,” Clark said. Click here to learn more about the guide, or to download a copy of the Criminal Records Expungement and Pardon guides that Chelsea Clark helped produce.